I picked these up in a discount bin at Sally Beauty Supply and figured I would try them out since I have been dying to try any kind of nail appliques. To my surprise, it was a pretty bad first impression. I am actually not sure if I want to try any more nail appliques in the future. My biggest problem: They take way too long to apply. I should have just painted my nails because it would have been faster. It really defeated my purpose for applying them in the first place! I needed my nails done for a trip I was leaving for during the next day. I wanted something quick that was really nice looking and would last me at least four days. Eureka! These appliques seemed to be the perfect match …or so I thought. 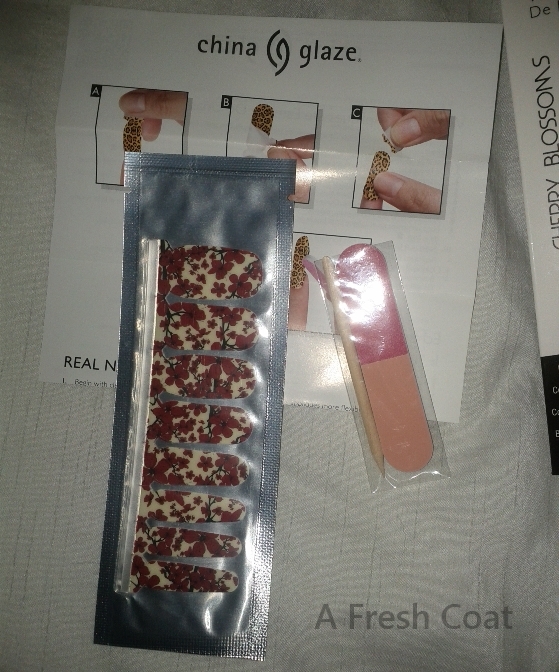 The package comes with everything you need to achieve these beautiful cherry blossom nails: 1 wooden stick (to push back cuticles), 1 file (for shaping your nails and trimming the excess appliques from your nails), instructions, and 16 different sized appliques (that are to fit all nails). 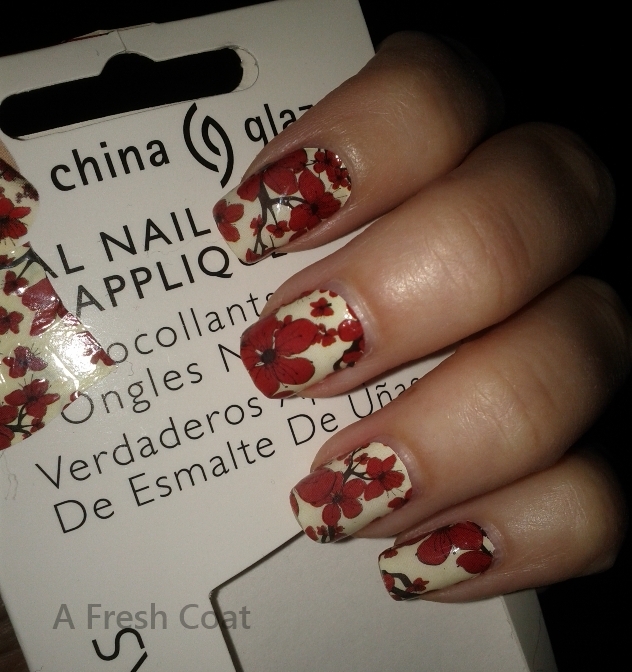 Even though this set came with 16 different sized appliques, they still did not come with the right sizes for my nails. They were either too big or too small. I could only use two on each hand that really properly fit my nails …so I believe this was the root to all other problems! I have seen other brands of appliques that come with 20 in the package, so maybe those are the ones I need to get? Still, I have a feeling I will have the same problem with any others. My size problem caused an issue where the applique was either too big (I actually had to try to cut it down to fit on my nail) or it was too small (I was forced to stretch out the pretty design, making it look like washed out crap). I am not sure which problem was worse, but this was extremely time consuming and took me an hour to figure out what to put where. Next issue, once I peeled these things apart they were very hard to maneuver and it was way too easy to mess up. Once they stick together the only option is to try to pry them apart. Then they are too far gone and stretched out to use. I had to try to find another applique that was somewhat similar or just deal with the messed up one. This process of actually sticking them on to my nails, trying to figure out how to cover my nails completely (making them at least half decent), probably took another hour and a half. OK, so far its about two and a half hours. Now filing these things off of your nails is not as easy as it would seem! They were sticky and floppy (not a good mix). They took a lot of filing to get rid of the rest of the applique. The filing also chipped the top of the applique on my nails, causing immediate tip wear. So I just applied this nice new manicure and within seconds it looks like I have worn it for two days. At this point I really was considering just taking everything off because I really had lost all hope about it even lasting the four days I needed it for. I was just thinking about going with a nice classic solid color of polish on all nails, which would have taken me only about ten minutes to fully apply. 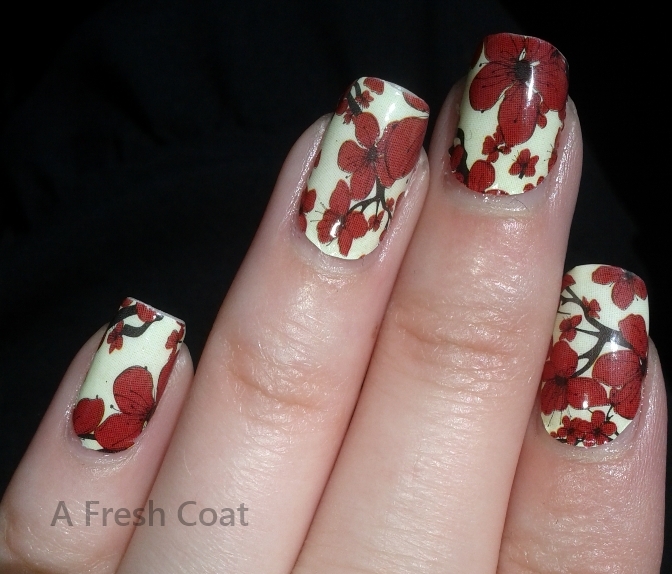 The last step was to apply top coat. 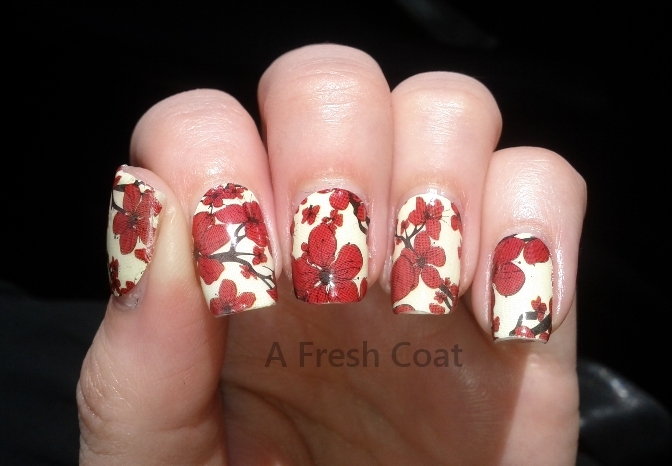 They recommend using China Glaze, but I used Seche Vite. Somehow I managed to finish after almost three hours. Yep, it would have been way faster to just paint my nails to begin with. I must say these do have a beautiful design and look good from further away. They actually seemed more like I was wearing tattoos on my nails instead of nail polish. I guess they didn’t turn out too bad in the end. However, I think they look horrible up close, since they don’t fit my nails properly. Maybe sometime in the very distant future I will try them out again …but it’s really going to be awhile. 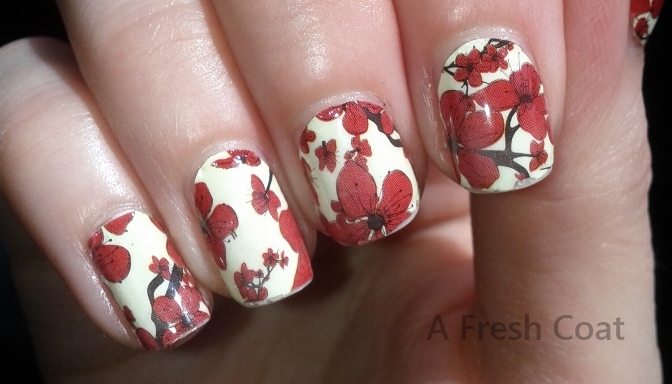 Have any of you ever tried nail appliques? If so, what kind? Did you have a better or worse experience than me? Hopefully, it was better!